With Christmas around the corner and the bustle of the high street beckoning, why not escape to one of these European hot-spots for a shopping trip with a difference? 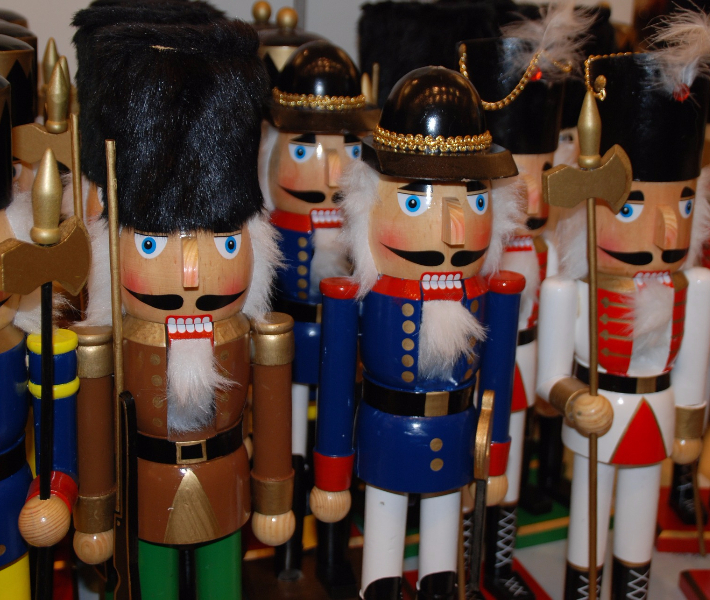 A motif used throughout Christmas decorations, the Nutcracker is a popular painted figurine which is more ornamental than functional. Depicting military figures with gaping mouths, these can be spotted throughout German Christmas markets. According to German folklore, these items were given as keepsakes to bring good luck to your family and home, with the trinket representing power and strength. 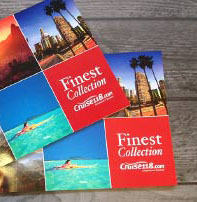 Their whimsical expressions, colourful costumes and rich history are an ideal novelty for anyone’s Christmas stocking. Intricate and delicately designed, glass baubles are commonplace on many trees during Christmas. 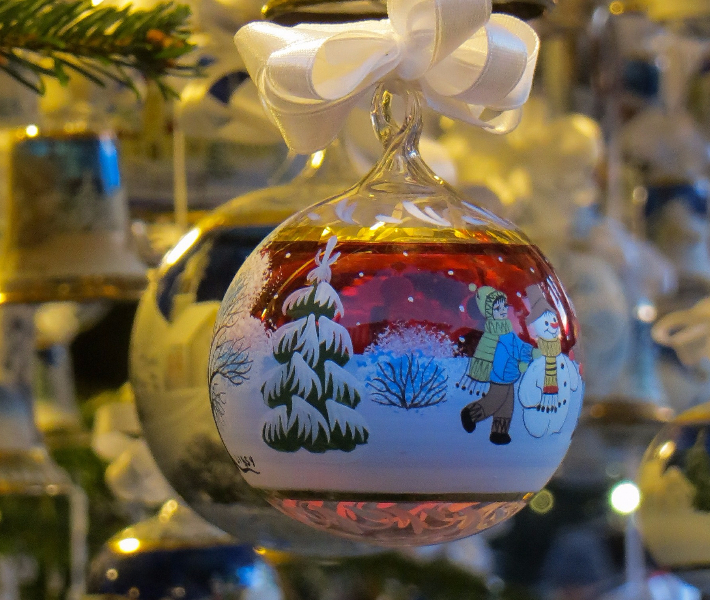 The markets in Vienna showcase many beautifully blown ornaments to carefully select with your loved ones in mind. Schönbrunn Palace markets play to the tune of Mozart in the day, with a backdrop of the yellow Palace enveloping the stalls, and by night, twinkling lights create a glowing atmosphere as locals and tourists meander through the market. Set the scene with a nativity set including a biblical cast of disciples and donkeys. 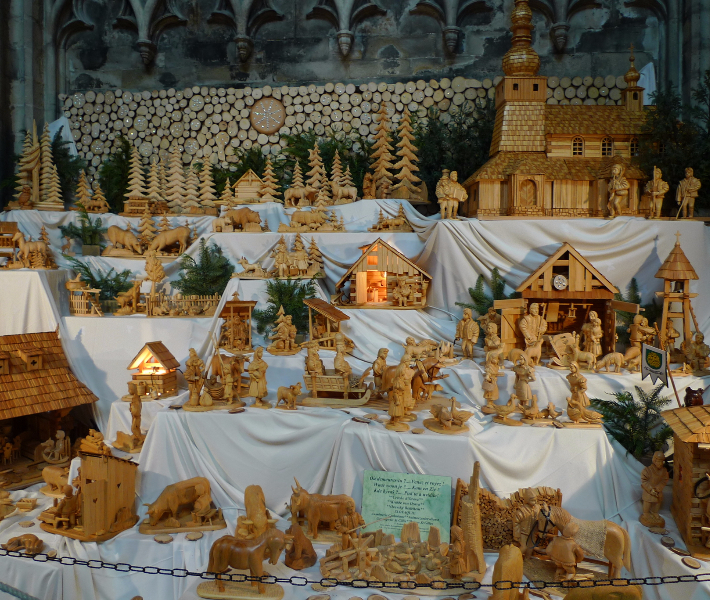 Rome plays host to several stalls that showcase wooden figurines and hand-carved scenes. Visit the Piazza Navona, the main market in Rome, and select your personalised nativity set, with endless varieties and styles available. One of the most popular selections is the Jesus in a nutshell, which places the tiny tot cradled in a nutshell – a precious addition to any collection. 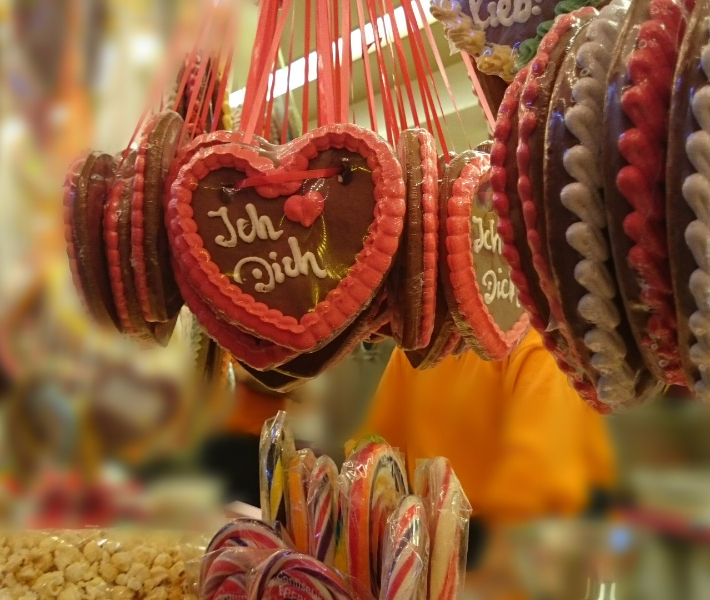 One of the things you will see dotted everywhere during Christmas is the gingerbread heart, sold in many Christmas markets around Europe. Famous for its gingerbread is Gdansk, even featuring a 400-year-old Gingerbread bakery that also functions as a museum. Though not featured directly on any River Voyages river cruises, you could take a trip while exploring the Elbe or Danube. 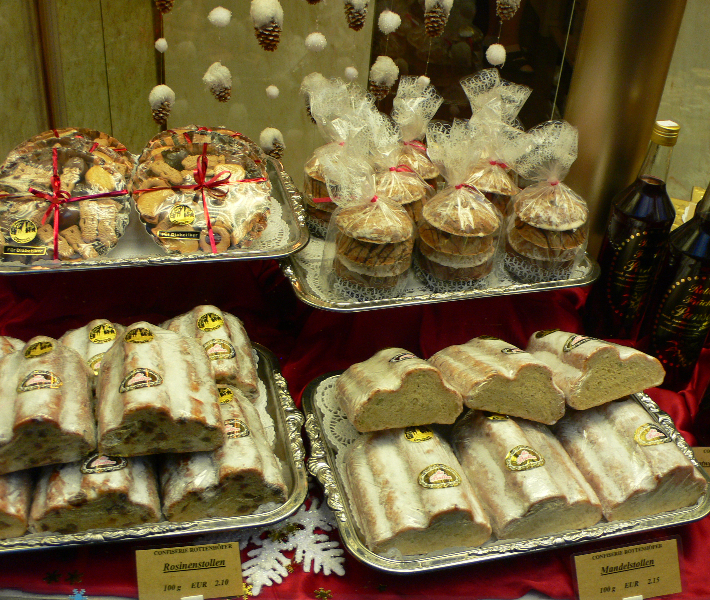 You could also opt for warmly-spiced lebkuchen, found in Nuremburg, which is sold in giant loaves. Another German favourite is stollen, a heavy yeasted cake that is filled with fruit and marzipan. The finest is considered to originate from Dresden, where on the 8th December locals and tourists alike gather to worship a giant stollen. Stollenfest celebrates the food, parading it through the city to the Striezelmarkt, the ancient market, where the Stollenmädchen (stolen maiden) cuts the first slice. Creating a golden glow and burning with a sweet honey fragrance, beeswax candles are a pleasant treat to gift to your family at Christmas time. 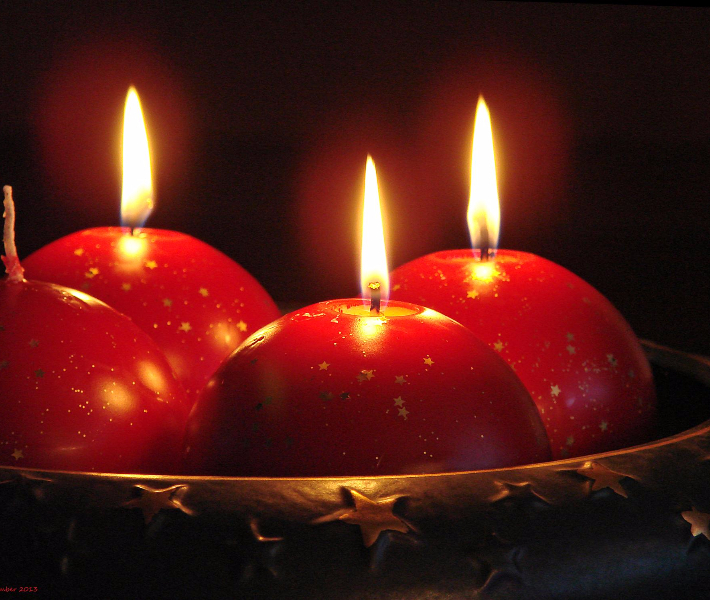 This time of year, it wouldn’t be the same unless illuminated with the flickering sparkle of candlelight, and stalls are laden with traditional beeswax candles throughout Europe, each producing their own festive twist. Exploring cities and towns during the winter months presents many magical moments, from snowy window frames to heavenly scents of Glühwein. 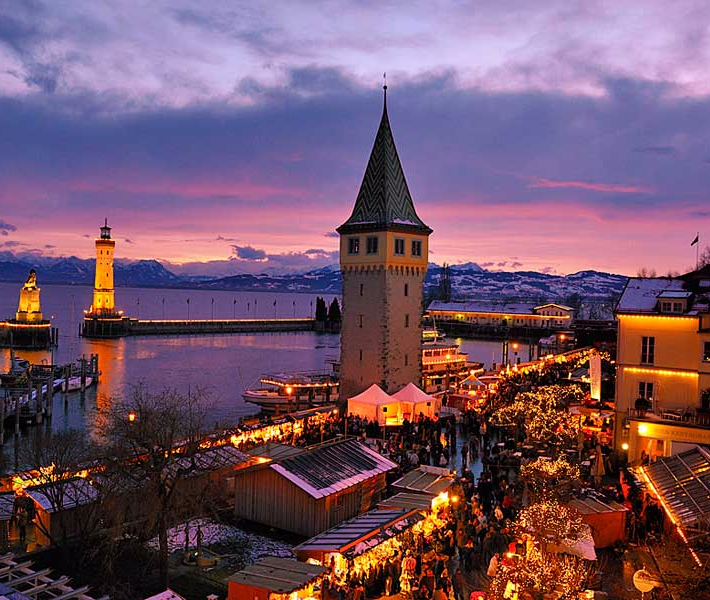 Enjoy walking between the festive stalls of Europe’s best Christmas markets while selecting pretty presents for your family and friends back home. Would you like to sail on a river cruise during Christmas? Have you experienced a festive river cruise? Let us know in the comments below!